Medical costs continue to loom large over retirement, a report from Fidelity Investments says. The estimate assumes the couple is covered by traditional Medicare, the federal health plan for the elderly. The estimate is based on life expectancies of 17 years for men, and 20 years for women. The estimate takes into account Medicare premiums, deductibles and co-insurance — the share of medical costs paid by the patient — for medical care as well as for prescription drugs. It also takes into account some services that may be excluded by Medicare, like routine vision and hearing exams, eyeglasses and hearing aids. The estimate doesn’t include potential costs for most dental services, over-the-counter drugs or, more important, long-term care. (The cost of long-term care insurance, meanwhile, is also on the rise, a recent analysis found). My mother is 90 and has Alzheimers and a variety of other ailments. Her expenses would be on the high side of the typical retiree. I manage her life and care, and I bear much of the out of pocket expenses so I have a pretty good idea of the costs. Not counting long term care costs, her out of pocket medical expenses including Medicare and Medigap premiums and prescription drugs are about $7,500, and she takes multiple medications. If my father were still alive, I can imagine that their combined expenses would be around $15,000 per year. So the $240,000 estimate seems reasonable. That’s enough to be ruinous for many Americans. This country is insane. We spend 19% of GDP on the medical business while no other civilized nation spends more than 10-11% and they all get better statistical outcomes. 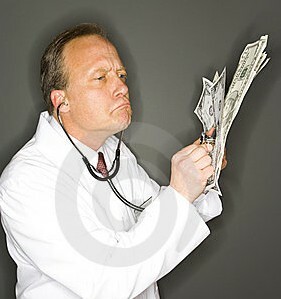 Doctors and medical labs and clinics are paid twice as much here as anywhere else in the world. Carpetbagging providers pull up stakes in their homelands to come to the US and profiteer because the pickings are so juicy. Meanwhile 4o million Americans don’t have access to affordable medical services. People die or face financial ruin because of this insane system. American business is less competitive in the world market because of it. This must stop. The playing field must be leveled in all respects. Other nations have crushed the private medical cartel that owns the US political system and have taken the delivery of health care away from the criminals that run that system. That’s the only solution that works. Obamacare is no solution. We must end the private, for profit medical business and put medical services under government control. Nothing less will work. The bribery of our elected officials by the medical industry cartel must end. It will end sooner or later, because this system is so corrupt and rotten, it will eventually collapse. That day cannot come soon enough for senior citizens and for all who are deprived of the opportunity to get medical care at a fair and reasonable cost. Post your thoughts below. No registration necessary. Even very modest changes in Obamacare are having trouble getting acceptance. It will be history if he loses this fall. Romney seems to be proposing the status quo even running away from his own successful plan in Massachusetts. Been in the medical insurance biz for 37 years and you are right. There is no fixing it. The only path to sanity is going to be single payer.